Here comes spring and that means gardening time! Are there any other gardeners here? Our family grows a lot of vegetables and a few flowers. As the days get longer, and spring arrives, it’s the major topic of conversation in our house. Today, the garden space we cultivate is large and productive. 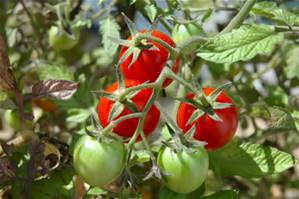 But years ago,even living in a little garden apartment with a 4x8 balcony that enjoyed the morning sun, I raised two daring cherry tomato plants in terra cotta pots. That was all the space I had, but it did just fine. I like seeing things grow. This week, dozens of tiny pots have been planted and have started to germinate, safely protected in the greenhouse to give them a good start. In a few weeks, when the Pennsylvania weather can be trusted , they'll be transplanted outside. Tomatoes, peppers, squash and beans lead the list. There is something so joyful about the sight of those little green shoots. It’s about the promise of spring, the birth of new life, the anticipation of the healthy harvest. Planting a garden is a “happy beginning”. Which is a nice addition, I think, to the “happy ever after endings” we love in our sweet romance novels. Happy gardening! Share with us what YOU grow!